There is nothing complicated or clandestine about the Broncos' offseason priority. Cousins or Keenum. Keenum or Cousins. There is nothing complicated or clandestine about the Broncos’ offseason priority. Cousins or Keenum. Keenum or Cousins. If the Broncos want to go from 5-11 thanks to a dreadful eight-game losing streak in 2017 to 10-6 and a playoff spot in 2018, they must sign one of two quarterbacks from the free agent market. The Broncos can lose out in their bidding battle for Washington quarterback Kirk Cousins. They can finish second in their attempt to nab Minnesota quarterback Case Keenum. Denver can’t miss out on both. The Broncos can show off their recently built, 115,000-square foot Pat Bowlen Fieldhouse, their modernized strength and conditioning room, expanded headquarters and a renovated kitchen and cafeteria that player after player says provides the best food in the NFL. What is it they say? The best way to a man like Kirk Cousins' heart is through his stomach. The Broncos and the agents for Cousins and Keenum can start negotiating contracts at 10 a.m. MT Monday. Talks can carry on until free agency officially opens at 2 p.m. Wednesday. Cousins is expected to get about $28 million a year, which would re-set the league's record contract. Keenum is more difficult to judge, but the $16 million to $20 million-a-year should cover it. There are other free-agent quarterback options. The Broncos did try to acquire quarterback Tyrod Taylor from the Buffalo Bills last week but he was shipped to Cleveland instead. Taylor would have paired up well with Paxton Lynch, the Broncos' first-round pick two years ago. Never mind. Other backup options include Josh McCown, Teddy Bridgewater and Sam Bradford. But they would mean backing up with a young quarterback prospect with the No. 5 overall draft pick. Which wouldn’t be a bad option. It might even be the best option for the long-term good of the franchise. But the Broncos wouldn’t be considered serious contenders in 2018. Given the uncertainty of Vance Joseph’s job status near the end of last season, the Broncos’ head coach needs Cousins or Keenum. If the Broncos, general manager John Elway and Joseph want to turn it around right now, they have but two choices. Cousins or Keenum. Keenum or Cousins. Kirk Cousins became Washington’s full-time starting quarterback in 2015. He threw 29 touchdown passes against 11 interceptions while compiling 4,166 passing yards and a 101.6 passer rating. The next season he threw for a career-best 4,917 yards with 25 touchdowns against 12 interceptions for a 97.2 rating. In 2017, a season that included an impressive Christmas Eve performance against the Broncos, Cousins threw for 4,093 yards, 27 touchdowns, 13 interceptions and a 93.9 rating. Washington in those three seasons went 9-7, which was good enough for a playoff wild-card berth, 8-7-1 and 7-9. All those numbers suggest Cousins is a top 6 to 12 quarterback, but even good quarterbacks need good players around him. Ask Keenum. In his first five seasons with three teams, Keenum was a combined 9-15 as a starter. Give him two young, talented receivers in Adam Thielen and Stefon Diggs, a Pro Bowl tight end in Kyle Rudolph, the league’s seventh-best rushing attack and No. 1-ranked defense, and Keenum went 11-3 for the Vikings last season with 22 touchdown passes against just seven interceptions. The consensus among the national media is Cousins will replace Keenum in Minnesota and the Broncos are the favorite to land Keenum. We'll see. The No. 3 option of McCown/Bridgewater/Bradford can't be dismissed as the negotiating period is McCown, a late-bloomer who turns 39 prior to training camp, has found a niche in recent years as a ‘’bridge starter.” Bridgewater wants no more than a one-year, make-good contract to prove he’s ready after essentially missing the past two seasons with a knee injury. Bradford has been on injured reserve three times in the previous five seasons because of left knee issues. If the Broncos wind up with any of those three, they would likely follow up by taking one of four quarterbacks with their No. 5 overall pick in the draft: Sam Darnold, Josh Rosen, Josh Allen or Baker Mayfield. They're all first-round worthy, if none approach the can't-miss caliber of an Andrew Luck or Carson Wentz. 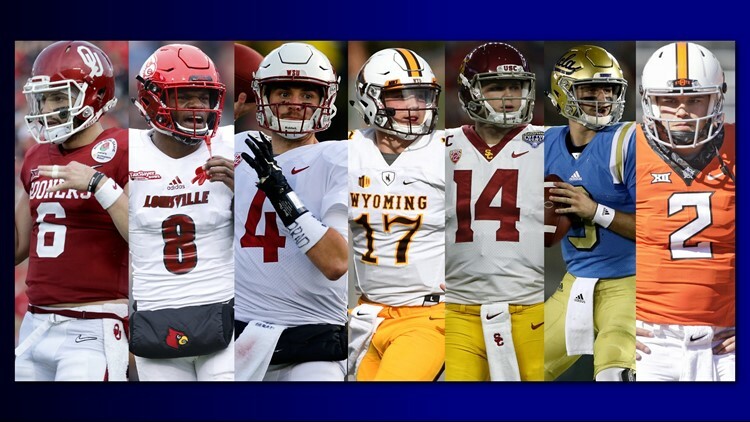 The Big Four would have a chance to eventually develop into a franchise-type quarterback but it’s difficult for any team to reach the playoffs with a rookie quarterback. It can be done – nine rookie quarterbacks have led their teams to the playoffs in the past 31 years, most recently Dak Prescott with Dallas in 2016. But none of the last 12, first-round quarterbacks of the previous five drafts reached the playoffs in year one. No NFL move is ever 100 percent certain to work out. But for the Broncos to go from worst to near first in a year’s time, the percentages are greater if they get either Cousins or Keenum, Keenum or Cousins.